Ocean themed raft die from Memory Box featuring seals, a turtle, an anchor, a sailboat, and more. 9 dies included. 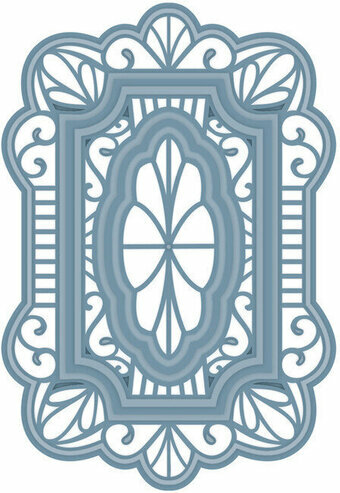 Craft die featuring a frame with an ocean theme, including a sea shell, a ship's wheel, an anchor, and a lighthouse. Pretty and innovative cutting dies to help you create beautiful cards, scrapbook pages and other handcrafted projects! Can be used with most die cutting machines. Ocean themed Impression Obsession craft die featuring an oyster in a shell. These are US-made steel dies compatible with most table-top die cutting machines. This is a single die measuring 1-3/8 x 1-3/8 inches. A small sea star is ready to add texture and fun to your beachy projects. Design area measures approximately 2" X 2". Sue Wilson-Indian Ocean Collection-Seychelles. Designed by Sue Wilson these cutting dies are an elegant collection of high quality steel designed to co-ordinate with each other. 6 dies. Sizes: Outside Die: 2.90" x 4.25", Smallest Die: 0.75" x 1.75". A crashing wave creates an emblem of beach, ocean and seaside fun. Design area measures approximately 2-5/8" in diameter. Marianne Design: Beary Cute Paper Pad. Can be combined with EWK1249 and EWK1250 to create bear themed scenes on your cards or layouts. 4 x 8 designs, 32 sheets. Size: A5 = 6" x 8.25". Cosmic Shimmer Textured Sparkle Paste from Sue Wilson Designs and Creative Expressions. A high quality dimensional paste with glitter in various colours can add a sparkle to any project using stencils (metal or mylar), die-cuts or embossed designs. Add a little or a lot... your choice. Lay it on thick for more dimension. Apply paste with a spatula, brush or sponge over craft projects. Jar Size: 50 ml. This Die-namics coordinates with the Mermazing stamp set for perfectly sized die cuts every time. It is open inside to allow you to stamp then cut OR cut then stamp. This feature makes the Die-namics lighter weight and allows for easier removal from the die. This 16 piece set includes: Mermaids (3) 1 5/8" x 3", 1 7/8" x 2 7/8", 2 1/8" x 2", Plants (5) 7/8" x 1 1/8", 7/16" x 1", 5/8" x 1 5/8", 7/8" x 1 1/8", 5/8" x 7/8", Shells (3) 5/8" x 5/8", 5/8" x 1/2", 3/4" x 5/8", Schools of fish (2) 5/8" x 3/8", 7/8" x 1/2", Rock 2" x 7/8", Turtle 1 1/4" x 5/8", Fish 7/8" x 5/8". MFT Die-namics dies are our very own EXCLUSIVE, American made line of steel dies. Die-namics dies work with most tabletop die cutting machines such as the Big Shot & Cuttlebug. Marianne Design: Eline's Ocean Paper Pad. 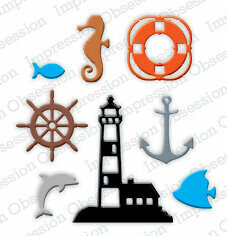 Matches perfect with COL1430 and COL1431 to create cute nautical theme scenes on your cards or layouts. 4 x 8 designs, 32 sheets. Size: A5 = 6" x 8.25". Joy Crafts Cut & Emboss Die-Under the Sea-Shells, Fence & Text Board. 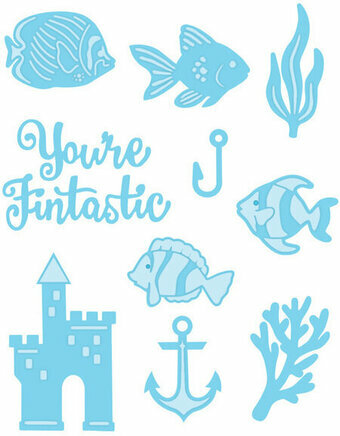 A great collection of dies for your nautical and beach themed cards and layouts including: shells, a sign and a fence. 4 dies. Smallest: 0.55" x 1.22", Largest: 1.85" x 2.36". Cutting and Embossing Die Seaweed and Airbubbles. 4 dies. Sizes: Bubbles: 0.20" x 0.20", Seaweed: 2.0" x 3.10". Ocean themed stamps and dies featuring a whale, a starfish, and a crab. Sweet and Cute, these Julie Nutting Stamps are waiting for you to customize them! Stamp them onto watercolor paper and color them with your favorite Prima watercolor products! Includes coordinating dies for easy cutting. Dies work with most die-cutting machines (sold separately). This package contains 6 cling stamps and 5 dies. 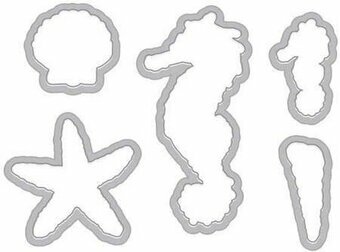 Ocean themed craft dies featuring seashells, a seahorse, and a starfish. Seashells at the Beach Dies set of 7 Dies. Coordinates with At the Beach Clear Stamps. Measurements: DIE 1: 1 1/4" x 1 7/16", DIE 2: 1 5/16" x 1 3/16", DIE 3: 1 1/4" x 1 3/16", DIE 4: 1 7/16" x 7/16", DIE 5: 1 1/4" x 1 5/16", DIE 6: 9/16" x 1 1/8", DIE 7: 9/16" x 1 1/2". Kaisercraft die featuring a Turtle. 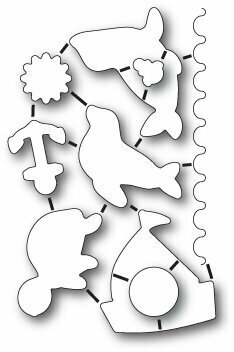 These steel dies will cut through cardstock, thin chipboard, felt, acetate, sticky back canvas, sandpaper, foam and much more! 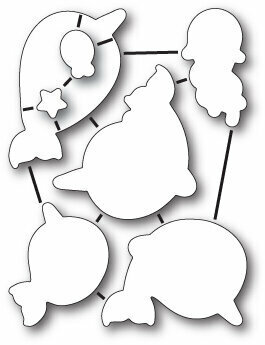 They work with virtually any die-cutting machine that will accommodate wafer-thin dies and are sure to become an essential ingredient in your paper crafting process. Craft die from Memory Box featuring a seashell, a starfish, and a ship's anchor. 0.3 x 0.3, 0.4 x 0.4 inch shells, 0.5 x 0.7 inch anchor, 0.5 x 0.5 inch starfish. Craft die from Memory Box featuring ocean seals. 1 x 0.6, 1.2 x 0.7, 0.7 x 0.4, 1.1 x 0.8 inch. Craft die from Memory Box featuring ocean seaweed. 0.7 x 3.4, 0.8 x 4, 0.6 x 1.7 inches. Set of 11 dies. Coordinates with Mermazing stamp set. Sizes: fish: 1"W x 3/4"H, whale: 2 1/8"W x 1 1/4"H, mermaid: 3 1/4"W x 2 5/8"H, banner: 2 7/8"W x 1 1/4"H, seahorse: 7/8"W x 1 3/8"H, seashell: 3/4"W by 5/8"H, starfish: 3/4"sq, splashing waves: 1 7/8"W x 3/4"H, water droplets: 5/8"-3/4"H.
New mixed-colored sequins in Ombre style color packet in a variety of sizes and matching our Hero Hues line of inks, papers and accessories. Apparently it's not safe to go back in the water yet. Our paper layering shark die is all too lifelike. Hope those two coordinating swimmers watch out! Hero Arts Paper Layering dies offer unique styles and designs around a new concept in paper crafting. Paper Layering allows you to cut normally, giving a pop-up style of cut, and then, after folding or curling the cut edges, the image reveals itself, giving a 3-D dimensional look to your paper. Hero Arts metal dies are made with precision cutting edges and sturdy constrcution, and are universally compatiable with most die-cutting machines. Craft die featuring several narwhal whales. 7 dies included. Craft die featuring a Seaside Dock. 3.8 x 1.8, 0.3 x 1, 1 x 0.8 inch. 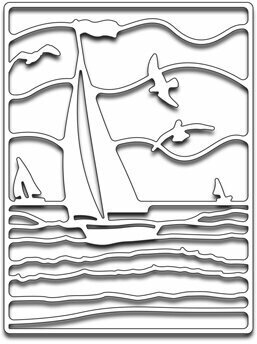 Use this custom steel die set to compliment our Love Puffin stamp & die set (AVE-ST-16-48 & AVE-D-16-48) or customize any other project or craft. Long rocky/jagged border measures 3 7/8" long. Our Exclusive Steel Dies are proudly made in the USA. Craft die from Impression Obsession featuring a sea turtle. This is a single die measuring 1-1/2 x 3-1/2 inches. This lacy and dainty seahorse edger is designed to pair with its counterpart (right facing - FRA10254). The edger features a beautiful design of a starfish, seahorse, sand dollar and shell amongst seaweed and coral. The die measures 5.5" x 1.875"